"Savory meatballs in a delicate white wine sauce. Serve with rice." Mix the pork, egg, Parmigiano-Reggiano cheese, onion powder, tarragon, and salt until everything is well incorporated; form into meatballs the size of a tablespoon. 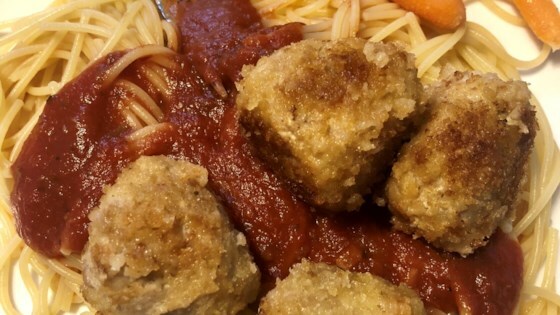 Spread bread crumbs into a shallow dish; roll meatballs in bread crumbs to coat. Heat the olive oil in a skillet over medium heat. Cook meatballs in hot oil until golden brown on all sides, 3 to 5 minutes. Add white wine half a glass at the time; cook at a simmer until the wine is reduced to a nice thick sauce, about 15 minutes. I doubled the recipe and froze 1/2. I did not make any changes.